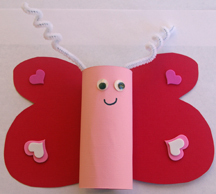 This pink and red butterfly is a fun Valentine’s Day craft for preschoolers. They’ll love decorating the wings. You can give them a head-start by cutting out the wings ahead of time. What You Need: 1 toilet paper tube; red and pink construction paper or cardstock (I used cardstock); 1 white pipe cleaner; 2 googly eyes; foam hearts; scissors; glue; black marker; pencil; tape. How to Make It: Fold red cardstock in half and draw half of a wing shape. Cut and open to reveal wings. Cut pink cardstock the length and width of a toilet paper tube and adhere around the tube using glue or tape. Adult should cut pipe cleaner in half and help child roll ends around a pencil for curly antennae. Tape inside toilet paper tube body. Glue on eyes and draw mouth. Glue or tape wings to back of body and decorate with foam hearts, markers, or any way you’d like. This entry was posted on Monday, February 6th, 2012 at 3:22 pm	and is filed under animal crafts, foam crafts, paper tube crafts, recycled crafts, Valentine and heart crafts. You can follow any responses to this entry through the RSS 2.0 feed. Responses are currently closed, but you can trackback from your own site.